Get to know H&M's New Icons, Jourdan Dunn, Andreea Diaconu, Sui He and Nadja Bender. Jourdan Dunn who was born in London in 1990, was scouted when she was 14. By 2008 she had become the first black model to walk the Prada catwalk in over a decade. That year Jourdan won the title ''Model of the Year'' at the British Fashion Awards, and she has since appeared on many international front covers including British and American Vogue. Read more about Jourdan here. Romanian model Andreea Diaconu was born in Bucharest in 1991, and is now based in New York. She started modeling in 2006, and was discovered by photographer David Sims in 2012. Andreea has since been featured on the cover French Vogue and appeared in campaigns for Dolce & Gabbana. When she's not modelling, she really loves karate. 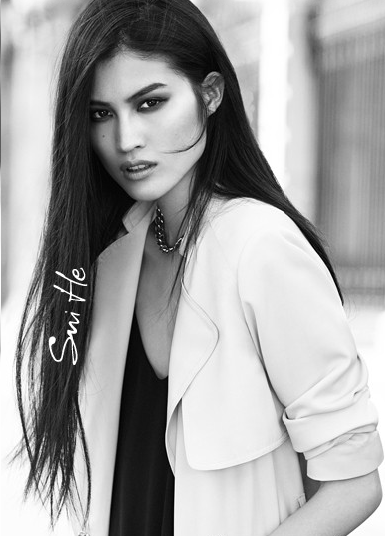 Sui He was born in 1989 in Wenzhou, a city six hours from Bejing, and in 2006 won a Chinese modeling contest. It was in 2011 that she broke onto the international catwalks, becoming the first Asian model to open a Ralph Lauren show. She's since become the first Asian global spokesperson for Shiseido, and was recently a guest judge on China's Next Topmodel. discovered through Facebook in 2011. Initially she wanted to continue her studies, but soon gave modelling a try, and in Febuary 2012 she opened the show for both Alexander Wang and Rodarte. Nadja has appeared in campaigns for Gucci and Chanel among others, and would still like to finish her degree in nanotechnology.